KAWAUCHI, Fukushima Pref. 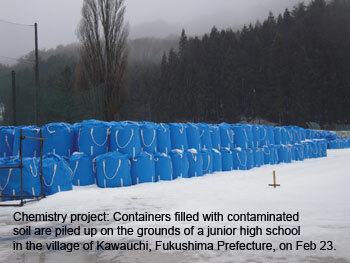 — During a visit in late February to Shidamyo, less than 30 km from the Fukushima No. 1 nuclear plant, a few elderly residents could be seen ambling around the tranquil rural district, but there were no signs of any children. Radiation readings in the area have been high since three reactors at the power plant melted down, and are currently between 1 to 3 microsieverts per hour — about 20 to 60 times higher than levels in Tokyo. Shidamyo, however, was never designated as an emergency evacuation preparation area since it is part of the city of Iwaki, Fukushima Prefecture, where low hourly radiation readings of around 0.1 to 0.2 microsievert have been recorded in most districts. But residents alarmed about radioactive fallout still urged parents with children to evacuate anyway, and about 50 of Shidamyo's 140 inhabitants fled the area, including all the children. "They moved to different places, some to other parts of Iwaki, while others moved outside Fukushima Prefecture altogether. We — the elderly — are the remaining residents," said Chuhei Sakai, a 62-year-old maker of "tsukemono" pickles and a farmer in Shidamyo. 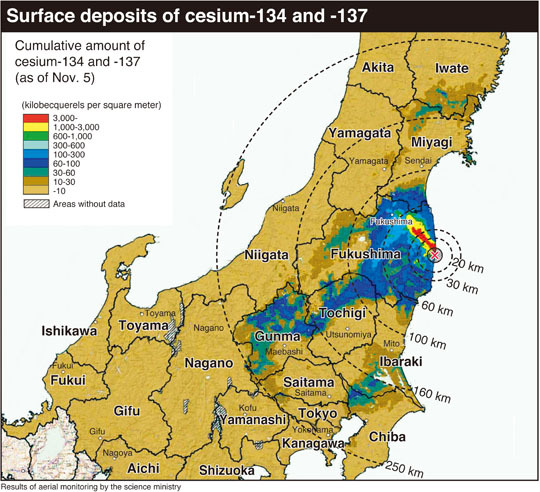 As of Feb. 23, Fukushima had seen 62,674 residents evacuate from the prefecture, a massive increase from the 38,896 evacuees estimated last June, according to the prefectural government. The total includes residents who notified authorities that they were evacuating, but still remain officially registered in the prefecture.